"Mister Popular": Sonic’s immortal enemy Mammoth Mogul is back and their battle has taken on a whole new twist. Can Sonic find out who or what Mogul is going after? With hordes of villains from today as well as from Sonic’s past emerging to attack the blue blur, does Sonic have a chance of defeating the massive power of Mammoth Mogul? SCRIPT: Ian Flynn. ART: Matt Herms (pencils) & Jim Amash (inks). Mammoth mayhem cover by Tracy Yardley! & Jason Jensen. FEATURING CLASSIC TALES FROM SONIC SUPER SPECIALS! By popular demand, we are happy to follow-up the speedily selling "Sonic Archives" series with a brand-new reprint collection: "Sonic Select", which will reprint many of the much-loved stories from the Sonic Super Specials! 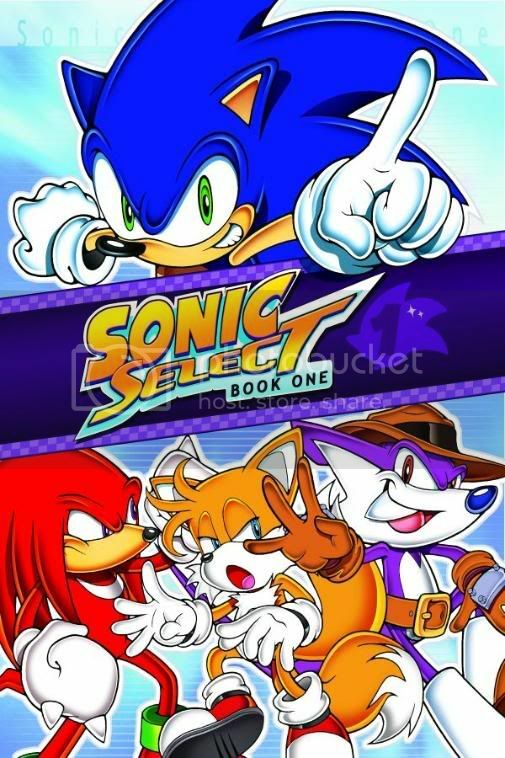 The best of the best will be featured in this series, including stories starring fan favorites Knuckles the Echidna, Miles "Tails" Prower, and Princess Sally Acorn, plus characters who don’t often get to hit center stage in the main series. 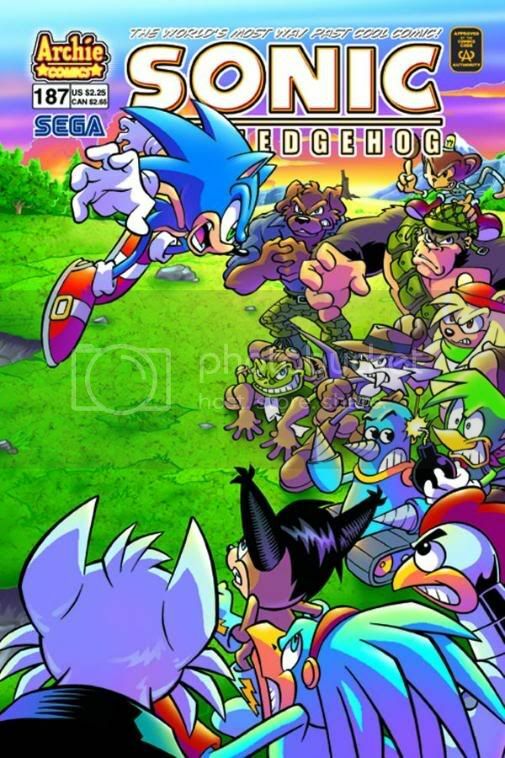 Not only that, but "Sonic Select" will also be filled with everything from both the classic era of Sonic super-team Mike Gallagher and Dave Manak, to the later stories with varying artwork from such Sonic legends as Art Mawhinney, Patrick "Spaz" Spaziante, Steven Butler, Ken Penders, and others! It also features the first appearances of many of the biggest fan-favorite characters! With reprints from "Sonic: In Your Face", "Sonic & Knuckles", "Triple Trouble", and "Sonic Live! ", this is one Sonic compilation you will not want to miss! "The Quest": Princess Sally journeys to the dangerous Forbidden Zone to seek out a mysterious treasure, and you’ll be just as shocked as she is to discover its true nature! Features the first appearance of Sally’s friend and hand-held computer, Nicole. "The Mirror Zone": Sonic and Tails follow one of Robotnik’s Swatbots into the Mirror Zone, a place where everything (including the very text on the page) is flipped backwards! "Tails’ Tallest Tale": Tails’ very first solo story finds him facing off against Robotnik himself! "Panic in the Sky": The Floating island is hijacked and runs off-course, leading to all sorts of infighting and false accusations! Based on the hit game Sonic & Knuckles featuring Knuckles the Echidna. "Fire Drill": Knuckles’ first solo story! Who is the new mysterious stranger on the Floating Island, and do or she pose a threat? "Lord of the Floating Island": Knuckles comes to the aid of a lost kangaroo, but that’s just the beginning of the strange things happening on the Floating Island! "Triple Trouble": Bounty hunter Nack the Weasel makes his grand debut in this adaptation of the popular video game. "Sea Fox!" Wait until it encounters Octobot! "First Contact": Knuckles must decide whether Archimedes is friend or foe as the mysteries of the Floating Island continue to unfold. "The Substitute Freedom Fighters": When Robotnik captures the Freedom Fighters, Sally’s trainees team-up with others to save the day! SCRIPTS: Mike Gallagher, Angelo DeCesare, Mike Kanterovich, Ken Penders. ART: Dave Manak, Jon D'Agostino, Harvey Mercadoocasio, Rich Koslowski and Art Mawhinney. Super-terrific cover by Patrick "Spaz" Spaziante! "Title Mismatch": It’s tag-team trauma for Eggman! 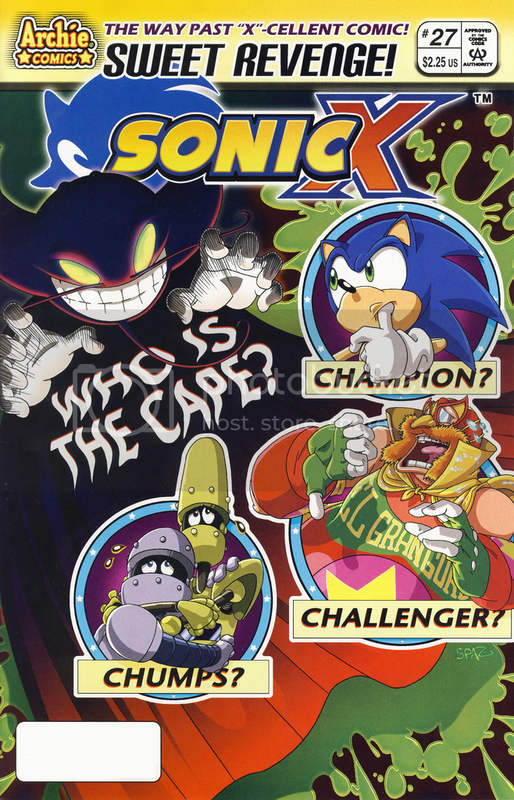 When Eggman finds himself an outsider in his own evil Empire, a team-up of unimaginable proportions takes place. 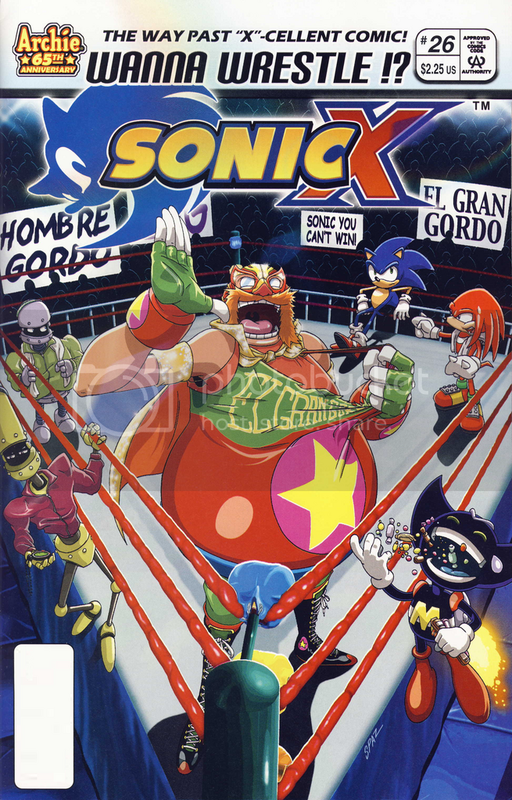 El Gran Gordo and El Rapido Azule, the masked wrestling sensation must band together to save all of Station Square! Will this team be a slam or will this all end in a tag out?! Get ready to rumble in this much talked about new issue of Sonic X! Turnbuckle tearin’ cover by Pat "Spaz" Spaziante! 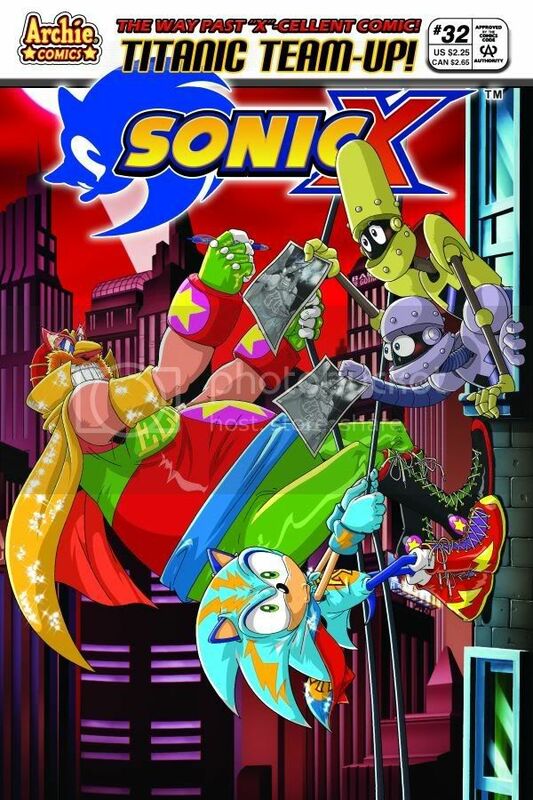 Sonic also has to beat down every villain he's ever faced. Get ready for Perfect Chaos, That creepy lizard thing from Comic 3, and Finalhazard to go down with a single attack! He's been a wrestler. This is nothing new for the Sonic X comic.